Happy Lunar New Year! You can better enjoy each story if you click on the title of a story in the bulletin where you'll be taken to the story on our website, displayed in easy-to-view full-page format. We've started to include the date each story was posted because they're archived on cmirotary.org and it's helpful to know the date when the story was posted to the club's website. I will start with an appeal. We are off to a very busy start for 2019. 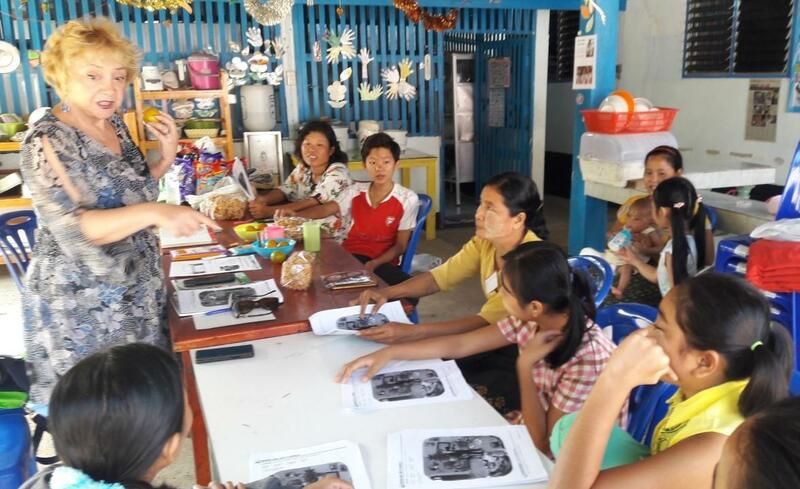 Our club’s mission to improve the lives of children in Northern Thailand through our club projects focusing on Child Safety, Health, and Education demands a great deal of effort and commitment from CMIRC members and friends. There is much to do, and if you would like to help us by joining the club, or by making a donation, please see the information at the end of this article. One of the real pleasures of being president of the CMIRC is visiting and seeing first-hand how our club has changed children’s lives. For the past two years we have partnered with the Warm Heart Foundation on various projects, in fact, the directors of Warm Heart, Michael Shafer and Evelind Schechter have become important community resources for our club. Their foundation provides housing, board and education for nearly forty children in Phrao. 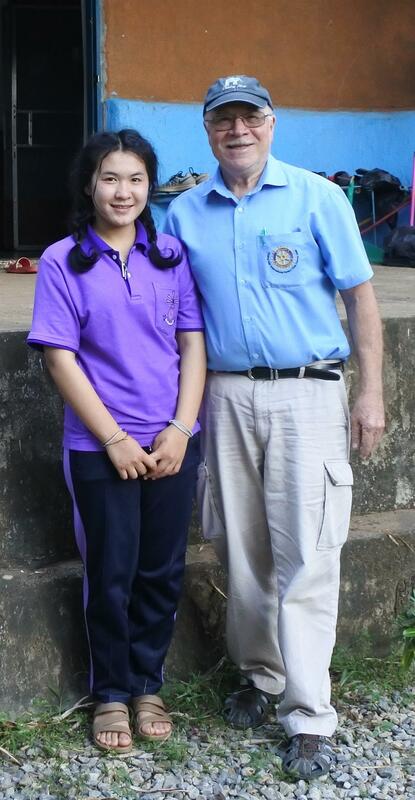 CMIRC has for the past two years supported one of those children, Nong Saa (pictured at right with me). She is a delightful young person, and very much wanted to thank us for what we have been able to do for her. Another great community partner for CMIRC is Philanthropy Connections, led by Sallo Polak. President Designate, Clarence Shettlesworth and I had an excellent meeting with Sallo to discuss our continued joint efforts to provide warm winter clothing to children in mountain villages here in the North. We also explored possible school-based clean drinking water projects and village-based public health projects. I’d also like to mention one of my personal favorite community partner events. Every year we send a CMIRC team to help judge the Chiang Mai International School (CMIS) National History Day Event; this year over a quarter of the judges were from CMIRC! CMIS is the home of our CMIRC-sponsored Interact Club and it is always a pleasure to see the well-researched work these young people produce. Several were selected to go to the regional event in Singapore and I’m sure some will be selected to go to the finals in Maryland/Washington, D.C. Above left with Jan Pieter Brinkman from RC of Hilversum-International (NL) and above right with Miguel Ferrer from the RC of Kunming (PRC). This year the Upper Northern Thailand Rotary Chapters, thirty-one in all, honored the CMIRC by selecting us to work with the Rotary Club of Chiang Mai – Wattana to organize and plan Chiang Mai Upper Northern Thailand Area Installation of 2019-2020 Rotary Club Officers. This has meant PE Colin Jarvis and I have been quite busy in January helping to plan an event for about 300 people. It will be on the 29th of June from 5 to 9 pm at the Wattano Thai Payap School in Chiang Mai. Rotarians reading this are very welcome to attend! Watch future Bulletins for details. Some of the biggest news for CMIRC continues to be our upcoming move. We have decided that we will move all of our CMIRC equipment to our new location on February 21, after our last Board meeting at our current location. 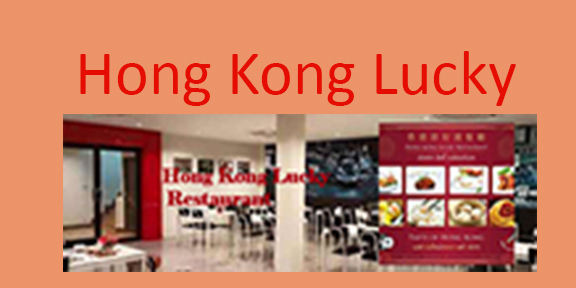 After February 21, all CMIRC regular and committee meetings will be at the Hong Kong Lucky Restaurant in the Top North Hotel just a few steps from Thapae Gate. Our CMIRC 5th Birthday Party on the 23rd of February, will be our first meeting in our new home! This Birthday Party will also include the first annual Children’s Charity Duck Dive Race. Be sure to contact one of the CMIRC members you know to get a duck in this race! Ducks are 500 Baht each. The prizes will be great (20,000, 10,000, and 5,000 Baht gift certificates at the merchant of your choice, including Amazon and Lazada), and, since only 300 rubber ducks are diving and racing, the odds are pretty good. You do not need to be present to win! All proceeds will go to our children’s charities. Finally, we are very happy to report that we conducted Pre-Induction Meetings for three possible new members, (Cynthia) Jianping Song and Brian Poole, have already been approved for induction at our regular meeting on February 12, and Olivia Route, who, we hope, will soon be approved for induction on the same date. New members bring new energy and new ideas, we are looking forward to welcoming Cynthia, Brian and Olivia to our club! As the reader of this Bulletin can see, CMIRC is doing a lot of great work in our Northern Thai community, especially if you consider that we only have 23 members! So, the message this month ends again with an appeal to our readers. 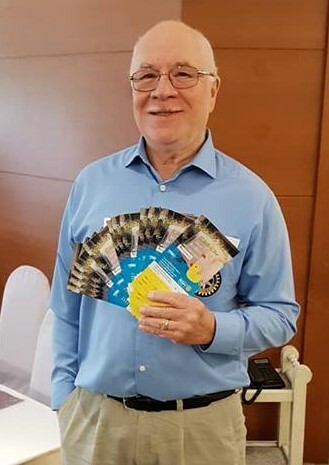 If you live in Chiang Mai or know someone who does, and you think they would be a good candidate for membership in our club, please let me know: john@cmirotary.org. If you wish to make a financial contribution to the CMIRC, please contact treasurer@cmirotary.org. If you wish to make an in-kind contribution (we especially need children’s toys, sports equipment, and school supplies), please contact president@cmirotary.org or 09 4856 3011. CMIRC is turning five years old! Chiang Mai International Rotary Club is celebrating their 5th anniversary with a fun-filled rubber duck dive! We are planning a fun and delicious evening at Hong Kong Lucky in their new location at Top North Hotel on February 23 at 6 pm. The first ever Rubber Duck Dive in Chiang Mai! You’ve heard about our golf ball drop? Well, now its rubber ducks! We will float our ducks over the waterfall at the Top North Hotel pool, first one over the line wins! So be sure and pick your lucky number! Each duck is 500 baht and gives you a chance to win amazing gift vouchers, paid for by our generous sponsors American International Tax Advisers and Top North Hotel. Top prize will be 20,000 baht in gift vouchers of your choice (Lazada, Rimping, Central for those in Thailand, Amazon for those outside the country), second prize, sponsored by American International Tax Advisers, is 10,000 baht and third prize, sponsored by Top North Hotel, is 5,000 baht. The event will be promoted and results announced on Happy Radio 98.5 FM. The number of ducks (and tickets!) is limited to 300 so you have a really good chance of winning! Plus proceeds go to support our amazing children’s charity projects such as teaching underprivileged school children in Chiang Mai to be safe in water and how to swim (drowning is the leading cause of death for children in Thailand), the Mae Tao Clinic and their GED program, the Burma Children Medical Fund's B. K. Kee Patient House which supports gravely ill children from the border when they come to Chiang Mai for surgery, and our English Language Exchange club with BEAM (Bridging Educational Access to Migrants). Each duck is 500 baht and gives you the chance to win fabulous prizes and you do not have to be present to win. There will also be a limited seating dinner with many tasty authentic Chinese dishes (including duck!) from Hong Kong Lucky Restaurant at Top North Hotel. Dinner is 500 baht and wine and beer will be available for purchase. Contact treasurer@cmirotary.org or call 094-856-3011 to buy Duck Dive tickets, dinner or both! Buy a duck and help children in Chiang Mai with one of our wonderful projects. This is to suggest that CMIRC members, friends and family gather for dinner at CMIRC sponsor Pern's Restaurant on Huay Kaew Rd. at 5:30 pm on Saturday, 16 February and then proceed across the street to the Gate Theater at Kad Suan Kaew for the 7 pm performance of "Pirates of Chemotherapy" by Paul Shutte, directed by Toni Cacioppo. "Pirates" reminds us of of how the relentless spirit of the human condition responds to love and considers the idea that healing is different than a cure. This dramatic comedy is about six women who share a diagnosis of breast cancer, all of whom are in various stages of treatment, recovery, and remission. A portion of ticket sales for "Pirates of Chemotherapy" will go to benefit breast cancer outreach throughout Northern Thailand. 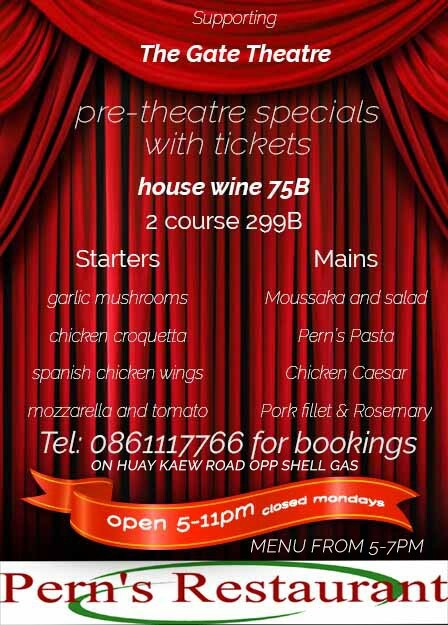 Pern's Restaurant has a special two-course menu (right) and discounted house wine available to theater-goers prior to the performance of "Pirates", February 14 - 16 at 7 pm. Pern's Restaurant opens at 5 pm. The play will also be performed at 4:30 pm on Sunday, February 17. Reservations for Pern's can be made online. Click here and mention you are with the CMIRC group. Tickets for the play are available at the Information desk at Kad Suan Kaew or at Pern's Restaurant. Lots of good news to report this month. First on the financial front, we learned the Swiss Lanna Society has selected our Children’s Water Safety and Drowning Prevention Program (CWSDP) to be the next recipient of its annual charitable contribution. Lanna Swiss Society President Eveline Willi has informed us that we will receive an amount probably between 40 and 50,000 Baht on Swiss National Day (August 1st). These Swiss Lanna funds will go to our CWSDP Program in Chiang Mai Municipal Schools. Then, CMIRC member Craig Clark and wife Rtn Ann have informed us that they have raised over US$ 4,000 from Minnesota Rotary Clubs for our CWSDP Program. They will be transferring the money this month and we have dedicated it to extending the Australian Aid-funded CWSDP Program in Phrao. Great start to the New Year! Thank you all!! As mentioned in the December Bulletin, CMIRC has received a 361,400 Baht grant from Australian Aid to expand our Children’s Water safety and Drowning Prevention Program. 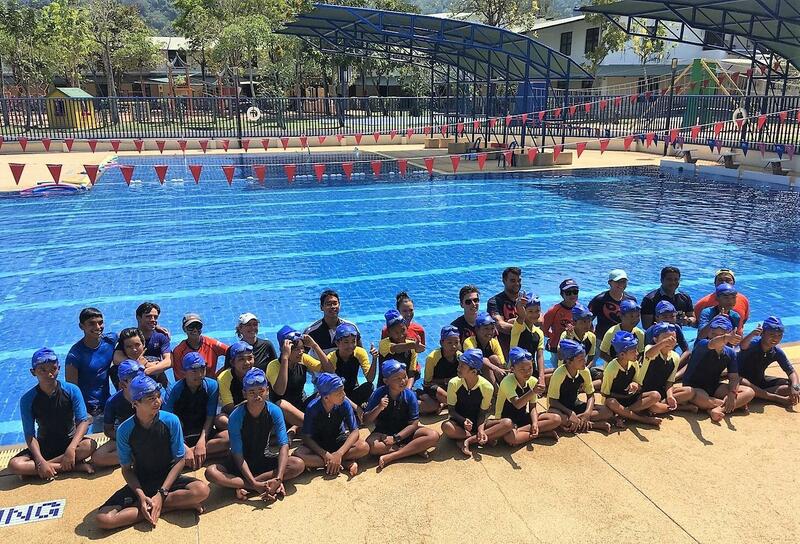 In January, working with the swim instructional staff at the British International School Phuket (right) and with the administration at the Ban Ya Literacy Centre for Burmese immigrant children, we taught sixty-eight refugee Burmese children survival swimming and water safety. The program was hailed as a success by all involved and plans are already being made for next-year’s program. Many, many thanks to the British International School administration, physical education staff and parent association; their generosity and dedication made this amazing program possible. On February 28 the Australian Counsel General in Phuket will be joining us for a certificate presentation ceremony for all sixty-eight children in the program. The next phase of this Australian Aid-funded program will be in Phrao, where we are working with the Warm Heart Foundation. We have developed a plan to begin our program there in February with one-hundred forty, 4th grade students at the Ban Chaeng Khu Ruang School. We will be sending our training team to work with local swim instructors February 8-10 and the first swim class begins on the 11th. We continue to seek good, reliable partners in Petchabun to develop a Safe Child Thailand-funded pilot Children’s Water Safety and Drowning Prevention Program there. Readers of this Bulletin, if you have service-minded contacts in Petchabun, would you please share that information with us? Past President Joe Evans and his local contact Khun Golf are planning the expansion of the Children’s Water Safety and Drowning Prevention in Sakhon Nakhon. Plans now show the first classes beginning in June. 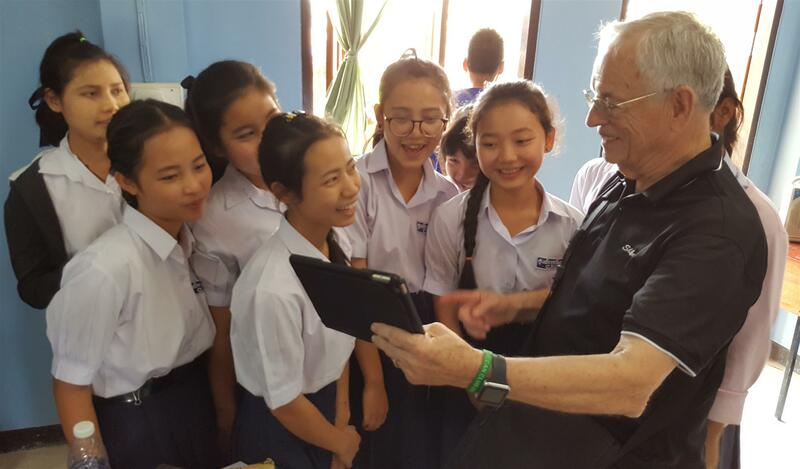 The Rotary Club of Patong Beach Larry Amsden Swim Safe Programme, under the leadership of program chair, Johan Storck, will continue the program with the Ban Sai Nam Yen School this year, with approximately one hundred 4th-graders. We have completed the Children’s Water Safety and Drowning Prevention Program for Rotary Year 2018-2019 with all eleven municipal schools. We will have a certificate ceremony for all children completing the program in May. We are already planning for next year’s program, which will be our fourth year. We can now say that every Chiang Mai Municipal School graduate has had the opportunity to learn survival swimming and water safety. Over 90% of the graduates have successfully completed our course. The Chiang Mai International Rotary Club fully funds this program as part of our mission to improve child safety, health and education in Thailand! Thank you to all our donors who make this funding possible. What's Up at the Mae Tao Clinic? As the Project Champion for the CMIRC Mae Tao Clinic (MTC) Project, I have at three areas of focus to share with you: fundraising, awareness and Rotary Global Grants. Fundraising: Many thanks to all who participated in the recent three-prong fundraising campaign. In the end we transferred a total of 178,000 THB to MTC for their G.E.D. Scholarship programs. Of course, the highlight of the fundraiser was "An Evening of Love and Support for the Mae Tao Clinic", held in conjunction with BABSEACLE at the Amora Hotel in Chiang Mai on 6 December, with Dr. Cynthia Maung of Mae Tao Clinic as the featured speaker. We are still working on establishing a 501(c) which will permit Americans to make a tax-deductible contribution through CMIRC. In the meantime, if your potential donation is large, please donate directly to Mae Tao Clinic and receive the tax deduction you deserve. MTC also offers tax-deductible donation opportunities is several other countries. Awareness: It has been my experience that people who just read about the Mae Tao Clinic often don’t get involved. However, people who go to the clinic are so impressed that they very often leave with a life-long love for the organization and the people they work so hard to serve. If possible, I would encourage you to go on the next MTC tour. Wednesday, 6 February – Travel to Mae Sot. (We have a van reserved that can take only one or two more passengers. Everyone is welcome to arrange their own transportation to and from Mae Sot. Room reservations can be made through me. I have an arrangement with the PP Residence affording us rooms well below the advertised rate. Wednesday 6 February – 6:00 p.m. We will meet in the parking lot of the PP Residence and go to dinner as a group. Typically, our first meal together is at Khao Mao Khao Fang. Friday 8 February – Those of us traveling by van will stay in Mae Sot and visit supporting organizations and attend specific meetings with MTC staff. Some travelers may choose to return to our homes on Friday. Saturday 9 February – Travel back to our homes or next destinations. Contact me for further details and to reserve you place on the tour. Many of the decisions are made, by the tour participants. Ask for what you want, and I’ll do all I can to satisfy your request. 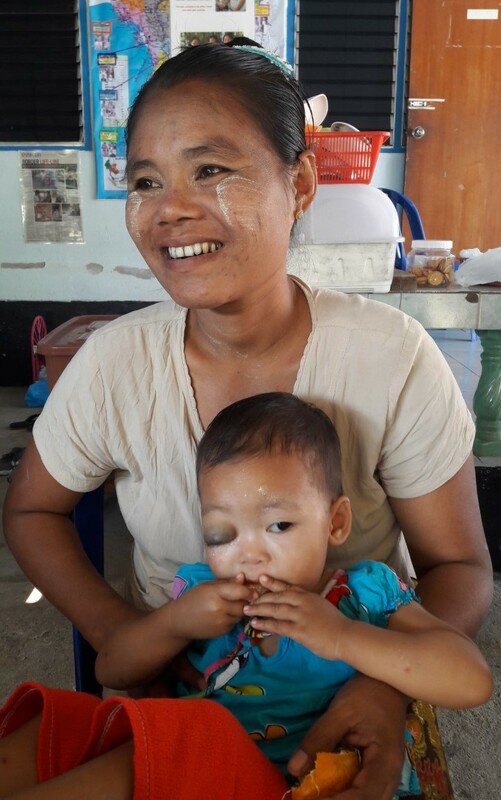 Rotary Global Grants: We are actively seeking potential international partners for one or more global grants in support of the Mae Tao Clinic. Child Protection Training and Teaching Capacity Building are currently the two most likely areas. Please contact me or our Foundations Chair, Clarence Shettlesworth for details. 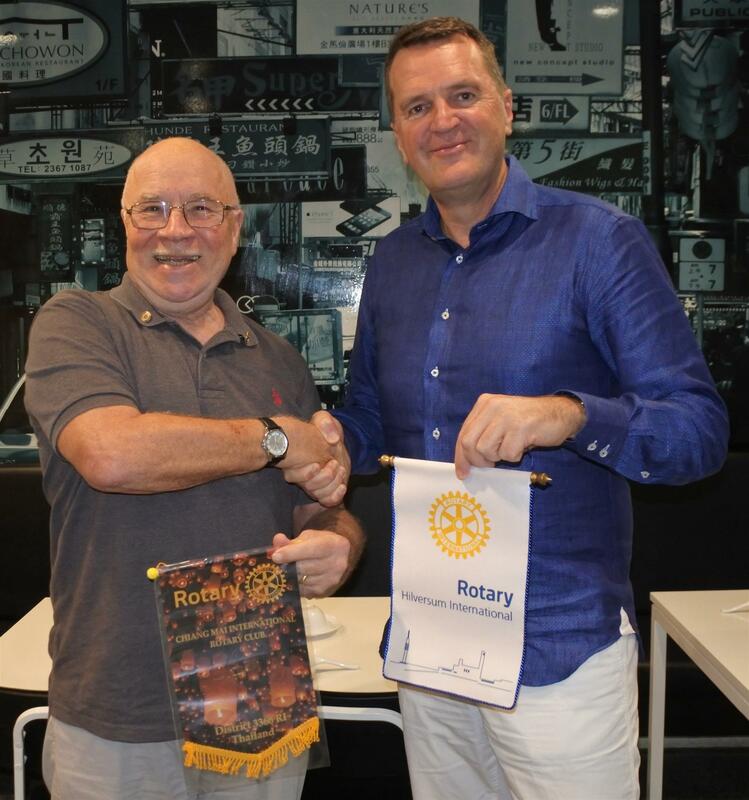 I have the honor of making a presentation to the Rotary Club of Royal Hua Hin on Tuesday, 26 February 2019. We will discuss possible opportunities for our two clubs to work together on both the Mae Tao Clinic Project and the Children’s Water Safety and Drowning Prevention Project. The first thing I would like to do is to thank Roger Lindley for the excellent story in last month's bulletin. The story he wrote illustrated the history of the B. K. Kee Patient house, its creation by and continued support from the Burma Children Medical Fund (BCMF) -- much of the story I was unaware of. If you didn’t get a chance to read it last month, click here to view it on our website. The B.K. Kee Patient House exists to provide a place where patients and their escorting family members can stay while they are waiting to be treated at hospitals in Chiang Mai, usually Suan Dok Hospital (Chiang Mai University Hospital). Most are referred from Mae Tao clinic when they have ailments that require advanced treatment. During the month of January, we had several new patients including a one-year old boy with a tumor on his right eye. Several patients with other growths and tumors including, sadly, a two-year old girl with an inoperable brain tumor. We had several patients with heart problems and a 49-year-old man with a badly burnt arm who had the first of several surgeries this month. It amazes me how brave and happy all these patients and their family members are. They always have smiles to greet us and when we are sharing language practice there is a lot of laughter and joy. As always, we provide some sanitary supplies and toilet articles every Sunday, bring donated clothing and a few toys, including Teddy Trekkers, made by ladies in Australia. We also bring fruit, cookies and other treats. Every week we also practice English language with the residents at the house. This entire month I am especially grateful for the talents of Rotarian Gordana Nardini from Croatia (shown left) for leading the practice. Whenever she is in Chiang Mai, Gordana works tirelessly and we always regret it when she returns to her home country each year. We also contribute to the well-being of the house by aiding in maintenance and upgrades of the house itself and its environment. We have several small improvement projects planned. Among those are the expansion of the use of safety covers for the concrete ditches around the house, some small concrete repair and caulk projects and safety railings for the new men’s bathroom. I am happy to announce that in February the Interact Club of Chiang Mai International School, sponsored by CMIRC, will be painting the wall in front of the house. Mike Gholson, our liaison has arranged with them to bring several student members of the club to the house on February 9th for a paint party. During January CMIRC sent BCMF 28,000 baht to cover the costs of one month of van transportation to and from Mae Tao clinic for patients. Some of this money was from three months' income from the raffle held at each club regular meeting. Last of all, I want to thank Rotarian Frank Spiteri from Australia, Marco Michel of Switzerland, Paul Mross and Concetta Maritati of Italy for your generous donations! They will be put to good use at the House! The BEAM Education Foundation was founded in December 2009. BEAM (Bridging Educational Access to Migrants) was created to assist with the unmet needs of Burmese migrant students seeking higher level college preparation courses and advanced vocational skills training. Most students must also work full-time jobs for their livelihood. 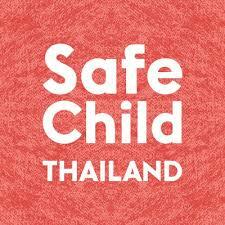 The BEAM Education Foundation is a registered non-profit foundation under Thai law. Tuition and textbooks are free of charge. CMIRC has been involved with BEAM both in supporting their Graduate Education Diploma (GED) program and with our English Language Cultural Exchange Club. The successful completion of the GED program gives the students accredited high school graduation credentials for applying to most colleges and universities. Without the GED, they could not apply for a college or university program. CMIRC involvement has been under the championship of Linda Pfotenhauer with team members Gary Herman, Bob Carroll and Roger Lindley. Linda provided excellent direction in developing the cultural exchange program for BEAM. Linda has chosen to relocate back to Botswana and will be closer to her daughter who works there. Linda’s responsibility as champion and team member will be assumed by Nick Dale. Linda and her daughter Jessica, pictured below, recently visited BEAM to say good-bye to the students. Rotarian Gary Herman thought it would be good to have some of the BEAM students present their personal stories and the BEAM story at one of the regular CMIRC meetings. Over the past several weeks they have been working both individually and in teams developing the Power Point story they would like to tell our club. There have been several reviews of each of their presentations and several rehearsal sessions with their fellow BEAM students. The students have learned about each other’s lives, their country and developed presentation skills. The CMIRC team members have learned from the students. Gary Herman will conduct a final dress rehearsal on Tuesday morning, February 12 at 10 am with lunch to follow prior to the BEAM presentations to CMIRC that evening. The challenge for the presenters is to match their presentations within the time limits of a CMIRC program slot. Unfortunately, the combined time for all presentations would be close to an hour. Each presentation would be interesting to the members of our club but the BEAM students will have to select the 3-4 presentations they think should be shared. CMIRC involvement with BEAM will soon be returning to review sessions for successfully passing the Social Studies module of the GED test. The Social Studies module focuses on four areas: Geography and the World, United States History, US Civics and Government, and Economics. If interested in BEAM or becoming involved with our programs there, please contact Nick Dale nick@cmirotary.org. Of the 60 million people displaced by armed conflict or persecution, 90% are civilians. Half of those civilians are children. These are the millions of reasons why Rotary is so engaged in service projects, fellowships and other Rotary-sponsored campaigns in pursuit of peace in our world. How Rotary makes help happen: We train adults and young leaders to prevent and mediate conflict. We aid refugees who have fled dangerous areas. Rotarians also address the underlying structural causes of conflict by relieving millions of people suffering from poverty, inequality, ethnic tensions, lack of access to education and unequal distribution of resources. Annually, up to one hundred Rotary Peace Fellows are selected to attend Rotary Peace Centers to participate in master's degree programs at one of the partner universities. Rotary Peace Fellows study subjects related to the root causes of conflict and explore innovative solutions that address real-world needs. There are now more than one thousand peace fellowship alumni working in over one hundred countries. Any board, whether big corporation or a non-profit, has a basic responsibility for the overall smooth and efficient operation of the organization. They have a basic responsibility for “Good Governance”. They are fiduciaries who steer the organization towards a sustainable future by adopting sound, ethical, and legal governance and financial management policies, as well as by making sure the organization has adequate resources to advance its mission. The standard Rotary Club Constitution and standard Rotary Club By-Laws provide a basic template which all Rotary Clubs must follow in setting up their Board of Directors. The size of the board can be influenced by the size of the club. Small clubs typically have smaller boards than larger clubs. Larger clubs may tend to have more committees and activities which require more coordination at the board level. In many cases the committee chairs are members of the board. The basic decision making in a Rotary Club is driven by the committees and their input to the club board is used by the board in setting priorities. A club committee chair: Oversees committee functions; convenes regular committee meetings and activities; supervises and coordinates the committee's work and reports committee activities to club board. Identification of a need in a community. Typically, a committee will identify a need in some community. This may involve a community assessment process. The size of the need (financial and member commitment) is quantified and a proposal is made to the board on: what the project is, how it aligns with club focus and Rotary International focus, who will champion the project, membership participation, project risks, potential partners identified, timing of the project, financial resources needed for the project, duration of the project and measures of success and sustainability. There may be multiple projects proposed by various committees which can compete for club financial and member resources. No matter how large a club, this balancing of needs versus financial and member resources is a continuing challenge. If the fundraising committee can not raise all the funds required for the proposed projects then how to resolve this discrepancy? That is what the board must resolve. If there is not sufficient membership numbers or interest in supporting the project, can new members be brought in to support the project? For long-term project sustainability, this may require the Membership Committee focusing on certain skills in potential new members. To do this, the Membership Committee may require additional funding for a special membership campaign. Do these financial resources exists in the club? The board must access this versus other club commitments in making this decision. 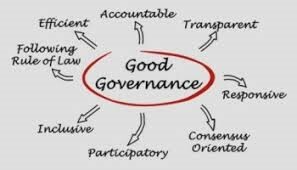 As said at the beginning, the club board has the responsibility to provide “Good Governance” for the club. Sometimes this is not an easy process and sometimes underappreciated by the general membership. Tuesday January 1 being New Year’s Day there was no first Tuesday of the month regular club meeting. The regular Sunday morning visits by members to the Burma Children Medical Fund's B.K. Kee Patient House for dispensing good will, toiletries, food and English conversation. Happy child is shown, left. The Monday, Tuesday, Wednesday and Friday Cultural Exchange and GED sessions with the students at The BEAM Foundation. On Thursday January 3, the Children’s Water Safety and Drowning Prevention Committee meeting at Bronco Kids. On Monday January 7, the Fundraising Committee Meeting at My Secret Café in Town to discuss a potential major fundraiser for replacing the Golf Ball Drop Fundraiser. On Tuesday January 8, the Membership Committee meeting at Hong Kong Lucky Restaurant. On Friday January 11, the Fundraising Committee meeting at The Top North Hotel to discuss holding a Children’s Charity Duck Dive Fundraiser event there on Saturday, February 23. On Tuesday January 15, our regular meeting at Hong Kong Lucky Restaurant where our guest speaker was Rebecca Weldon speaking on the projects of the Mae Fah Luang Foundation, under Royal Patronage in Chiang Rai. On Tuesday January 22, there was a Membership Committee Pre-Induction meeting with perspective member Brian Poole at My Secret Café in Town. On Tuesday January 22, the English Language Cultural Exchange Club met at Hong Kong Lucky to discuss a resource request from the BEAM Foundation for a basic English class during the month of February. On Tuesday January 22, the monthly CMIRC Board Meeting at Hong Kong Lucky Restaurant. 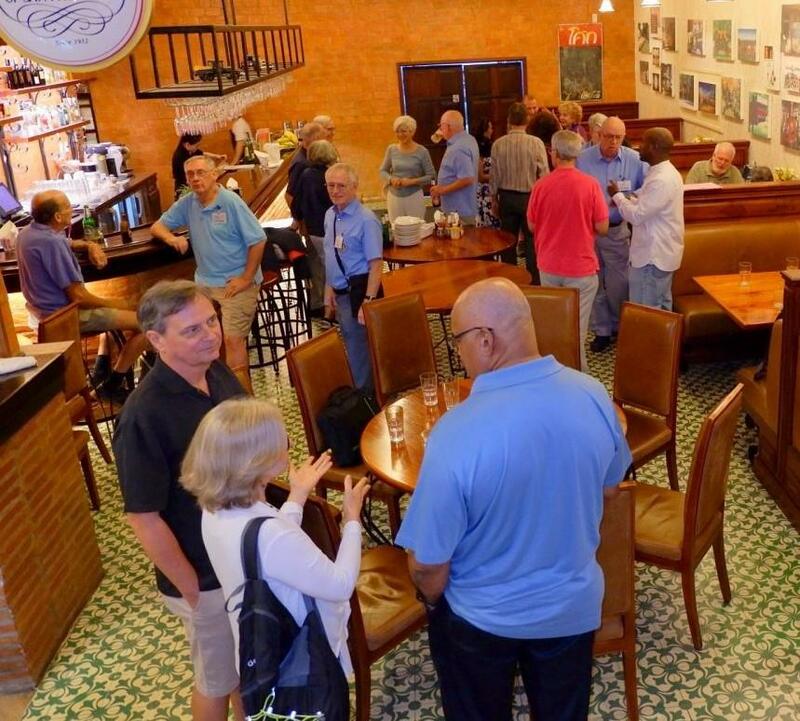 On Friday January 25, the last Friday of the month “Let’s Talk Rotary” informal lunch meeting was scheduled for The Faces Gallery & Gastro Bar. The lunch was moved to nearby Baan Phor Liang Meun’s Terra-Cotta Arts Café when was discovered that The Faces doesn't open until 1 pm. On Monday January 28, there were two meetings at BEAM Educational Foundation. One to discuss moving forward with the GED Social Studies module and the other on a request for assistance with a short term basic English language program. On Tuesday January 29, our fifth Tuesday of the month Social Night (right), this time held at The Duke’s at Maya Mall. For a complete and up to date list of events, check our online calendar. 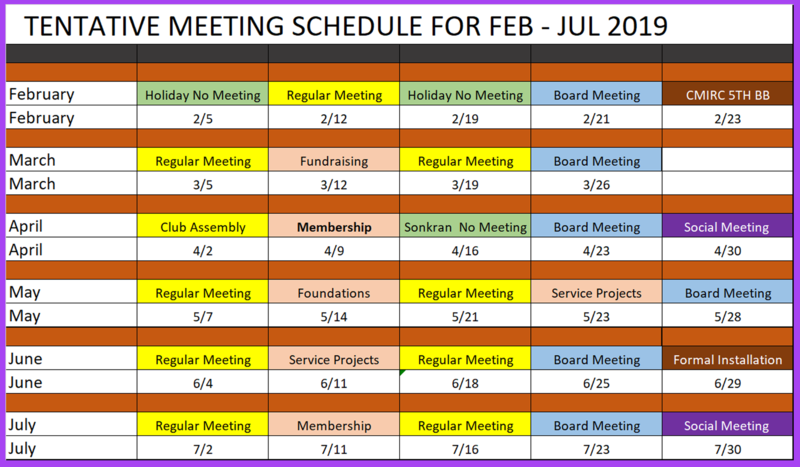 Here are just a few of the important dates for members of Chiang Mai International Rotary Club (CMIRC). These are opportunities to meet some of us and to meet other Rotarians from around the world! Every Sunday at 9:30 am, regular visit by club members to BCMF B. K. Kee Patient House. Interested? Contact Rotarian Gary Herman. 5 February 2019 - Chinese New Year that will fully fill our meeting venue and tie up Chiang Mai traffic, regular club meeting cancelled and postponed one week. 6 - 9 February 2019 - Tour of Mae Tao Clinic/Child Development Center, Mae Sot. Contact Jerry Nelson. 12 February 2019 - Regular Club Meeting, last one at the Hong Kong Luck Restaurant in the Old City. 7 pm with program by the students at BEAM. 19 February 2019 - Important Buddhist holiday that will tie up Chiang Mai traffic, no regular club meeting. 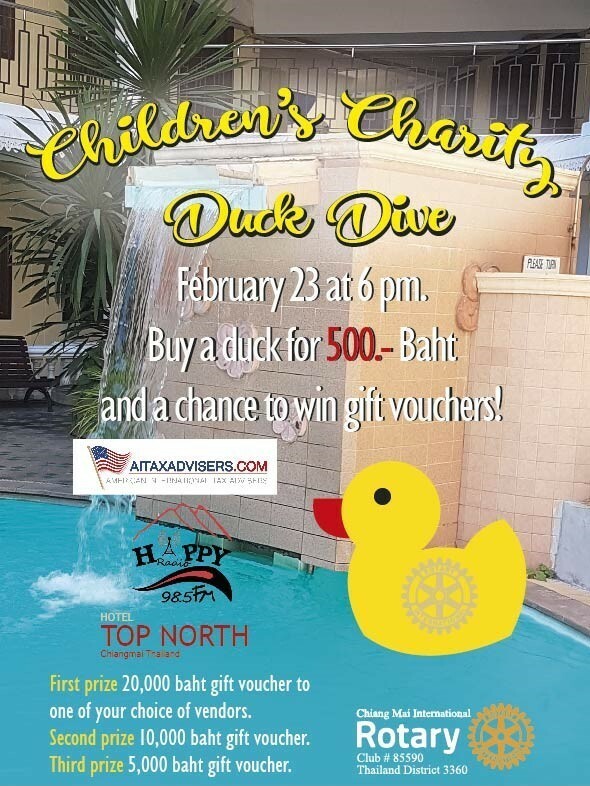 23 February 2019 – CMIRC’s 5th Birthday Celebration and Children's Charity Duck Dive at Top North Hotel. 01 – 03 March 2019 - Multi-PETS, Hatyai. 22 March 2019 - Tour of Baan Sak Rak House, Mae Chan (tentative). 23 - 24 March 2019 - District 3360 Conference, Chiang Rai. Contact John Schorr. 25 - 26 May 2019 - District 3360 District Training Assembly, Payao. 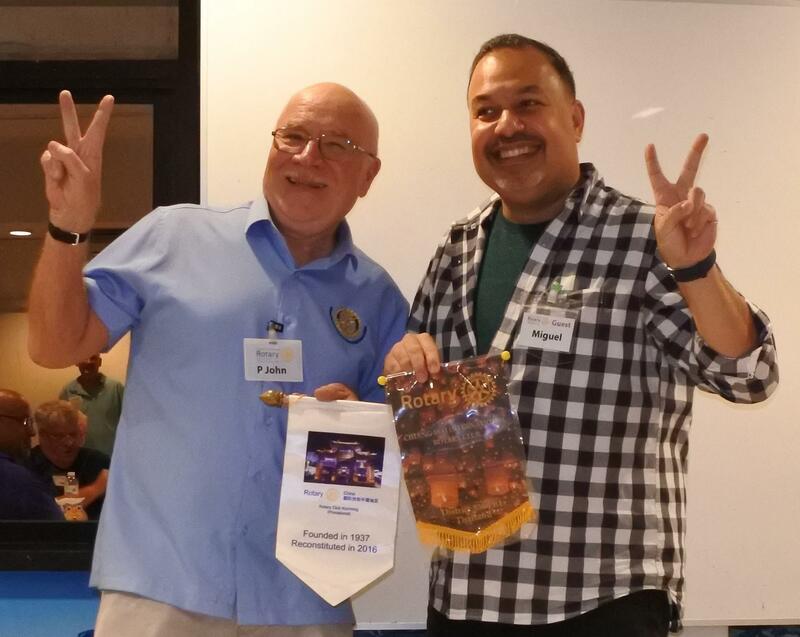 01 – 05 June 2019 - Rotary International Convention, Hamburg Germany (www.riconvention.org/en). 23 June 2019 - District Governor’s Salute, Phitsanulok. 29 June 2019 – Installation of Rotary Officers 2019-2020, Chiang Mai. 06 – 10 June 2020 - Rotary International Convention, Honolulu, Hawaii, USA. 27 June 2020 - District Governor's Salute, Chiang Rai. 12 – 16 June 2021 - Rotary International Convention, Taipei, Taiwan. 04 – 08 June 2022 - Rotary International Convention, Houston, Texas, USA. Rotary is not free; we give our hearts, we give our time and to some extent we give our money. Most of our heart, most of our time and most of our money goes to support our children’s projects. Yet we have operational expenses such as our website with its powerful tools such as this bulletin. We ask that you consider our sponsors for your needs. 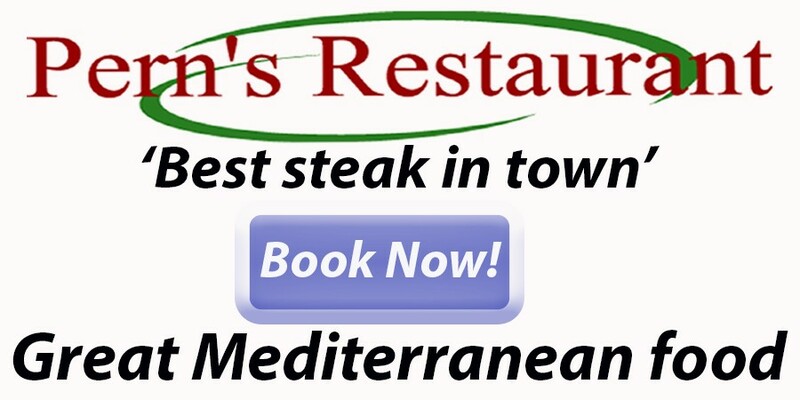 Pern's Restaurant, a Mediterranean restaurant on Huey Kaew Road, near Central Kad Suan Kaew mall, is located across from the Shell Petrol station. Brian Pern and his friendly staff (including the legendary Mickey) create a warm and welcoming atmosphere for diners to enjoy steaks, seafood, chicken, pasta and vegetarian offerings. There are nightly specials and half-price house wine on Wednesdays. Most Wednesday and Sunday evenings you can enjoy smooth jazz while dining. First time diners receive a free glass of house wine when they reserve through Pern's website. Book here. 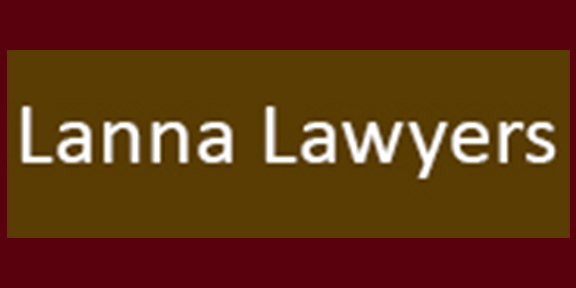 Lanna Lawyers is an expat-focused professional general practice law firm in Chiang Mai. They provide detailed and focused legal advice and services to expats and Thai nationals. Specializations include: Family, Business/Corporate, Property/Real Estate, Wills and Estates, Civil, Contract and Criminal Law. Other services include immigration, notary services, translations and accounting. Lanna Lawyers prides itself on the ethical, high quality and standard of care. Lanna Lawyers is a leader in providing pro bono services to a significant number of clients who are both in need of legal assistance and do not have the financial means and ability to pay for them. Fashion King is the best tailor in Chiang Mai. They have been in the same shop for over 12 years and receive the highest ratings from Trip Advisor and others. They feature authentic craftsmanship, superior materials and a great value! Their success is measured in customer satisfaction. The owners, Frank and Vanita will personally guide you through the entire process: design, material selection, fitting and delivery. CMIRC members -- this is the place to order a custom-made CMIRC dress-shirt or have a CMIRC emblem embroidered on your casual polo shirt. Frank and Vanita are the sponsors of the famous Chiang Mai fundraising event called “Bollywood Night”. They do a lot to give back to their community, helping the underprivileged in and around Chiang Mai. Hong Kong Lucky is a unique Hong Kong Chinese dining experience. The food is wonderful. Their Flagship Restaurant is in the Old City very near the regional police station. They have not only a dining room but facilities for private parties, large and small. Our Rotary meetings are held here. Hong Kong Lucky can be found on the 4th floor of Maya Life Style Mall, providing an excellent choice for a meal during your shopping experience. Hong Kong Lucky is also inside the Top North Hotel, near Thapae Gate where you can enjoy great food in a garden setting. Our sponsors donate money that supports our operational expenses, freeing funds for the projects we love. Please give them your support.